A study by researchers at the University of British Columbia provides compelling new evidence that bike infrastructure makes cyclists safer — a lot safer. The study, published in the American Journal of Public Health, examined the circumstances around the injuries of 690 cyclists who wound up in emergency rooms in Vancouver and Toronto during a six month span in 2008 and 2009. Based on interviews with the cyclists, the authors plotted where the injuries occurred on each cyclist’s route. Then for each route, the injury site and a randomly-selected control site were categorized in one of 14 different street types. 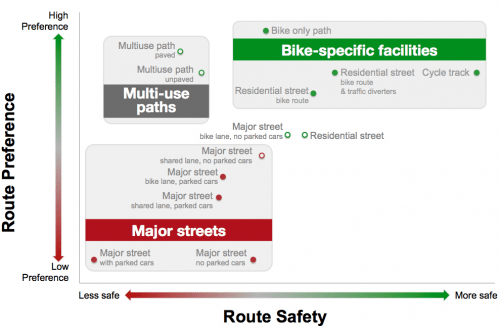 The authors used this method to measure the safety of each street type while controlling for other factors. They found that wide streets with parked cars and no bike infrastructure were by far the most dangerous for cyclists. Compared to that type of road, streets with bike lanes had injury rates 50 percent lower, while the risk of injury on protected bike lanes was a whopping 90 percent lower. Interestingly, multi-use paths — or off-street trails where cyclists, pedestrians, skaters, and other non-motorized modes mix — were found to reduce injury by a comparatively modest 60 percent. The study also isolated street conditions that increase injury risk for cyclists, including downhill inclines, road construction, and streetcar tracks. These conditions were found to ratchet up the chance of injury by as much as 200 percent. The results fly in the face of the once-influential philosophy of vehicular cycling, promoted most famously by activist John Forester beginning the 1970s. This school of thought held that cyclists were safest when they acted like vehicles, and that bike lanes made cyclists less safe. Foresterites successfully fought against the implementation of bike infrastructure in many American cities and held sway over bike treatments in highly influential engineering guides. This research bolsters the case for bike lanes — especially protected bike lanes — in American cities. The authors of AASHTO’s “Green Book,” the bible of transportation engineering, and its bikeway design guide should be taking a hard look at the data on protected bike lanes. The organization of state DOTs still considers these lifesaving treatments “experimental” for the supposed lack of research demonstrating their safety. Another point to consider in favor of separating bicycles from car traffic is the very negative health impacts–asthma and cancer–of breathing car and truck exhaust. (Study after study is showing that when it comes to public health, cars are the new cigarettes.) Even being separated a few feet from the pollution source helps cyclists a lot. My experience with many multi-use paths is that they usually are nowhere near wide enough to carry all the pedestrian/bike/skaters/etc they are supposed to serve, and they often have random obstacles and bumpy pavement thrown in to boot. It’s great that so many people want to use these paths, but one person with a jogging stroller and a dog on a leash can clog easily clog most multipurpose paths in both directions. Karen, that’s a lovely suburban greenway. Where would you fit such a greenway in NYC? I recently have felt the tug of the dark side, as the crappy, isolated, seldom-used industrial mile that I used to loop twice daily as part of my exercise route has been fitted with a physically separated 2-way bikeway with its own separate bicycle traffic light/sensor/cycle at a 3 way intersection and bike-only stop sign at a driveway. I used to be able to ride that all out on the side and rarely got stopped by the light. Now I know that I will always get caught by the light because I have to set off the bike sensor. Or I could try my luck, but there’s now a fence which may make me pretty hard to see me from a car at the intersections. They improved the pavement quality in some places, but there’s still some trouble spots, and now I’m waiting to see if it continues to fill with leaves and garbage and if they’ll worry about the storm drain that always backs up for days now that I can’t ride around the puddle for the barrier. I can sort of see what the bicycle drivers mean about substandard facilities–at least substandard for me wanting to race this section as fast as I can to the side of the mail and recycling trucks zooming past. Then, after a couple deep breaths to help me deal with the change, I realize how this route has GOT to be so much better for so many more people who are cycling this route and don’t want to race amongst the trucks. The only borough in NYC I am familiar with is Manhattan, so I can’t speak to the city as a whole. For the life of me, however, I can’t figure out why any cars are allowed into Manhattan at all. It is small, flat, with an incredibly dense population and good public transit. It is fabulous for walking and could be fabulous for biking. Indeed, 3/4ths of Manhattan households own no car at all, and yet even with the greatest population density in the US, even with so few residents owning cars, a remarkable amount of public space is devoted to car movement and car storage. While the sidewalks are often so jammed you can barely walk, cars with a single driver (or a driver and a single passenger) are allocated space that 20 pedestrians could fill. (Or perhaps 4 pedi cabs.) The car traffic diminishes the quality of life for all with its noise, vibrations, and serious pollution, while the loss of life due to vehicles in NYC (as reported weekly on Streetsblog) is nothing short of astonishing. So few gain convenience at the expense of so very, very many. I can’t even begin to understand why people I know who live in the suburbs of NYC drive into Manhattan for the evening because (they say) they can find free parking on the street. Even worse, once while trying to get from New Jersey to Connecticut, the apparent fastest route (the one we were advised to take) was to go through Manhattan. Granted this was a while ago (and I hope it is no longer true), but no one on a multi-state journey whose destination is not Manhattan should ever, ever, ever be tempted to get anywhere near Manhattan, much less choose it as their pass-through route of choice. Now I know there are a million reasons why this situation has developed as it has, why it became entrenched, and why changing it is so difficult. But allocating so much physical space to space-hogging cars that benefit a few over the health and well-being of the many is a choice, not something truly determined by population density or even city layout. Different choices are possible, if not, perhaps, probable. @45bab32ae8c58e3a92b70eebb7548492:disqus NYC has a considerable amount of existing grade-separated infrastructure in the form of expressways, els, and railways. The most cost effective way to build high-quality cycling routes is to hang bike lanes off these structures, filling in any gaps with purpose-built elevated bike lanes (similar in appearance to pedestrian bridges but running parallel to roads instead of across them). These trunk lines can then be supplemented with on-street bike lanes for the proverbial last mile of the journey. It’s not a question of whether NYC has the room or not for better bike infrastructure. You can always “make room” by going above (or even below) street level if the political will is there. What we have in NYC is a good start but without major trunk routes where cyclists don’t encounter cars or traffic lights for miles, that’s all it will ever be-a start. Just as cars would be far less useful without highways, you need an equivalent for bicycles. @KarenLynnAllen:disqus I’ve often pondered the same question-why are cars even allowed into Manhattan at all? It’s been talked about banning cars from the borough ever since the early 1960s, and yet there has never been the political traction to do so. I do feel though one of two things will happen in the next decade as the majority who don’t use cars become a political force to be reckoned with. Either we will finally ban cars from Manhattan completely, or we will at least require zero-emissions vehicles in Manhattan, which is a defacto ban on cars, at least until a majority of suburbanites own EVs. I feel we may even carry the latter one step further-requiring zero-emissions vehicles in the five boroughs. With fewer or no cars, getting around by bike would be a joy, even at street level. You can narrow streets, get rid of traffic signals altogether, and have great lines of site at intersections once you disallow on-street parking. The sooner all this happens, the better. If NYC doesn’t take these steps, then hopefully we’ll at least build elevated bicycle routes to get the bikes above the fray. So unsafe bicyclists (the ones who were in this study because they got injured) are safer in protected bike lanes. An important argument for separated bike lanes involves their many advantages over on-street bike lanes during inclement weather. In wet or icy conditions, both cars and bikes are at greater risk of skidding. In the case of on-street bike lanes, there is precious little room for cyclists to survive skidding accidents unscathed (especially on narrow bike lanes). A further advantage of some separated bike lanes is their reduced opportunities for being spashed by passing motorists. Either reinvent public space to contain space safe from cars or ban cars affirming the fundamental human right idea of fairness in the rule of law. > So unsafe bicyclists (the ones who were in this study because they got injured) are safer in protected bike lanes. > What about safe bicyclists? They must be off driving their bicycles with True Scotsmen. Another safety not thoroughly discussed here is the subjective safety, yet it is arguably equally as important in terms of convincing people to ride. It’s way less intimidating when you don’t have to “share” the road with large SUV’s and pick-ups driving towards you from behind, not always able to pass, at 30, 35 or 40 mph, or more. I doubt most people are or ever will be comfortable riding in very close proximity to motor vehicles. Even if ALL drivers were courteous, the physics of a moving vehicle isn’t going change, all things being equal. You only have to look over to the 2 most cycle-friendly countries (Holland and Denmark) to see what their safety statistics say, and proportion of cyclists (it’s estimated to be > 90% and > 80% of the entire population that ride a bike at various times in the two countries, respectively). That includes ALL demographics and ages of people who ride out on the streets. Even if we included all the Americans who only will ride a bike which they’ve driven to the park on the trails there, I doubt we would still come anywhere near that number of people who ride a bicycle, ever. What I’ve noticed from all my years of riding is the absence of elderly people or children riding their bikes out on the street. I can personally speak from experience in Copenhagen that EVERY single street is accommodating to cyclists in one way shape or form. I never once felt stressed or unsafe or squeezed off by cars at any time while cycling there. And Holland apparently does a considerably-better job as an entire nation for cycling. The key is to there for examples. That’s no good. If anything there should be more bike lanes. Perhaps I can get Soma bicycles in Salt Lake City. The Teschke study is one more example of a traffic-safety study written by people with no expertise in traffic studies and published in a journal whose editors and referees also have no expertise in traffic operations. Furthermore, the authors, at least, show pro-bikeway bias of the popular kind, based on ignorance of traffic operations. The most outstanding error concerns the definition of cycle track and the calculation of cycle-track crash rates. A cycle track is a path for cyclists alongside a street and intersecting with the same driveways and streets as has that street. The car-bike collision problems occur where traffic crosses or turns. The authors included in their cycle-track crash statistics sections of a popular park path which do run near a road, but never intersect with other traffic. Therefore, the length of this path, with zero crashes, and the traffic upon it, large, were thrown into the calculation of the crash rate for the only two blocks of cycle-track in the city. No wonder the authors calculated a wondrously small crash rate for cycle tracks. Furthermore, the authors’ bias on bikeways allowed them to rate bike lanes as much safer, when the most important factor in reducing car-bike collision rates, by their own data, was the absence of on-street parking, which they failed to properly mention. These defects would have immediately disqualified the paper had it been submitted to a journal whose editors and referees had bicycle traffic operations expertise. Drive ways happen in many countries, not just Somerville? Where does it say they were unsafe bicyclists? I was a safe bicyclist but still got injured because a car used the bike lane to pass another car on the right and knocked me into the curb. what about the other factors you mentioned? Debris, two way bike traffic at intersections where drivers only looking for oncoming vehicles?